My mother never knew her father or his history. Her father left her and her mother when she was 2 years old. She didn’t know why nor where he had gone. She never heard from him again. Her mother soon left to find work and my mother was left to be raised by her grandmother and step grandfather. She was a lonely child and always longed for brothers and sisters. Her mother eventually remarried but never had more children. When my mother retired, she and Dad sold their home and stored their memories in boxes with us children and took an extensive trip across the United States. Being of a curious nature, I was looking through the boxes one day and found the marriage license of my mother’s mother and natural father. It was an exciting discovery. Without delay I rushed to the phone and called the operator of the small town in which they were married and asked if she would give me the names, phone numbers and addresses of all of the Shermans in the town. I told her of my discovery and how excited I was to find my mother’s father. The operator was very cooperative and gave me several names. I soon called or wrote every one and found a sister to my grandfather. He had died several years earlier, ironically, just a few months after my grandmother. My new found Grand Aunt was delighted to be found and told me that my grandfather had returned home, remarried and had four more children. My mother had brothers and a sister after all. My grandfather had never spoken of what had happened or why he had left his first family. When my mother and father returned from their trip, she was overjoyed with the news and planned a trip back to see her new family. It turned out to be both a joyful and a sad venture as they had a marvelous, tearful, extended family reunion. While there, my mother had a heart attack and died. Not however, before she had realized her three lifelong dreams: Seeing her six children grow to be happy, productive adults; visiting New England in the fall; and having siblings. Needless to say, I was hooked on family history and have been doing it ever since. I knew that wasn’t true, so I dug and delved and pulled bits and pieces together. I talked to a lot of people who had been in the area a long time, looked through many books, and visited many agencies. I had never been interested in history when I was in school, but I had always loved reading historical novels. Now the local history was becoming like a family history, or historical novel. It was becoming a part of me because it related to me personally. I was part of this town’s history. My husband and I lived here with our children. Our friends were here. Our children were growing up here and attending school here. Our memories were being made here. It was also easier to research than family history, because it was local. I am not a historian, nor even a writer, but felt that I should record some of the information I have found so that all of my notes would be available to others. This book is my effort to record this information. Much of it has been told to me by others as they remembered it. History is often recorded according to the eye of the perceiver. I would appreciate any new perceptions or additions to the information contained herein and perhaps someday will add them to the text. 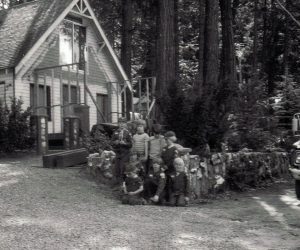 Cub Scout Troop 104, in front of the building that became The Haven restaurant. Thank you, Marilyn. This is wonderful. I have come back several times to this site over the last several months, often rereading what I have read before and seem to be noticing new additions, or at least sections I had not read before. Your section on the Blair family was particularly enjoyable this morning as I found the first photograph I have seen (after searching for a long time online) of the old wooden bridge the Blairs had built over the American River between Pacific House and the south base of Peavine Ridge. We have property and a home about a stone’s throw from the old Blair Mill that was across the river from Pacific. Some hardware from the old bridge can still be seen at the site on the north bank of the river, and the old concrete footings for the mill structures can be seen at the mill site, where my daughter and I used to spend afternoons imagining and wondering what it was like. Across the road from the mill site, there also still stands the rock fireplace of what I have been told was a small schoolhouse that may have served the children of the area. Thanks again for your work on the Pollock Pines Epic…I hope it continues to grow and expand for a long time to come. I am a fellow Pollock Pines resident with a great love of historical romances. I was given the gift of writing at a very early age. The first time I lived here was when I was a young girl and I fell in love with the place and vowed I would move here someday to raise my family. Long story short, I am a beginning writer with a huge desire to write an historical romance about this area including Black Bart, who used to rob stagecoaches on Bullion Bend. I am hoping to connect with people from this area who lived here a long time and know the history. I poo-poo the idea that Pollock Pines has no history and have set out to prove it. I stumbled on your website and was tickled to know there is someone else out there who thinks the same. If it would please you, I would like to get together with you over coffee or something whenever you are available. I am a ‘disabled’ U.S. Air Force veteran and wish to get going with my second career and am available at your convenience. Hello to all. My father’s family is from the Placerville area going back a few generations on both sides. I am interested in pictures and information regarding the Morton, Brown, and Carbine families. I know some of the Morton Ranch at Mosquito and of the Carbines at Sly Park. If anyone has any more information, I would sincerely love to know about it. thanks for thsi website, it is so cool. I’ll pass this on to my Mom, who wrote the book. She’ll get back to you soon. Awesome! Thanks for posting this. I was talking to Larry the barber in town a year ago and he mentioned your Mom’s book. Said he had a copy of it at his shop, but someone borrowed it and never returned it. I went all over the area looking for a copy and, of course, could not find one. You should let the folks at the El Dorado History Museum know you have this on-line (or tell whomever they need to let the volunteers know about it). We bought 10 acres by Pacific House and built a place there 5 years ago. My folks have lived in this area for 25 years and had no idea of the history. Tell your Mom what a fantastic job she did. We just love this area and am glad to now have some history to go with it. What’s the status on the missing photos? (eg – Cub scout troop picture on this page and the 50 Grand and Fire Department pics on the “Later Days” page, etc). Wow what a trip back in time. I grew up in Pollock Pines and attended Pollock Pines Elementary. We lived in the Pollock house for about 15 years. The hamburger place that used to be next to the house was a doctors office. I remember my dad installing a septic system and digging up the old bottles and bones! I remember 50 grand buring down. My grandfather and my dad went inside to try to put the fire out as I stood outside. I havent been back there in about 10 years but now I need to go back. Good page and please fix the pictures. Haven’t gotten any further than this page so far….Hope It’s Great…We have a Great Group at Facebook… You Know you Grew up in Placerville,Ca AKA Hangtown if …..
A small number of photos not able to display in your pages. If you want a list, I can provide. I love the website. I found a 1st edition in the bookstore in Placerville and read it cover to cover a few times. Recently found this website and registered for updates and blog. Very fun site. Thanks. So excited to find this website. 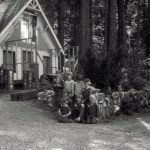 I grew up in Pollock Pines in the late 50’s and early 60’s. My parents operated the Suzy Q Motel which later became Wrights Motel. I went to Pollock Pines Elementary and Pinewood before we moved to Cedar Grove and Camino. I still have family out there and try to visit whenever I can. My Grandparents lived in the same house for over 40 years. It was the one right next door to the Elementary School and I remember my 2nd grade teacher Mrs. Wilson lived right next door to them. Such great memories.